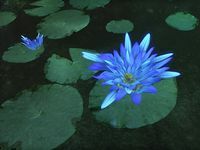 Sacred Lily is a rare water plant with a bright blue flower. This swamp flower is considered sacred to the Naga-Kur and is used as the goal during the trials of their young, prospective warriors. The plant grows in the pools at the end of the Path of the Lily in Murkmire. Sacred Lotus is a water plant with a showy display of petals and a gold center in the flower. There are always some lily pads nearby. 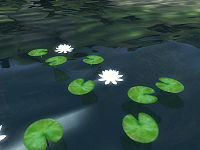 It can be found growing in most ponds and lakes in Cyrodiil. 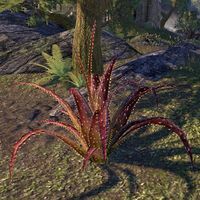 Salloweed is a variety of aloe plant that grows on Auridon. Its' leaves and stalks produce a thick sap  which can be used in medicinal salves. The salloweed's unique properties also allow it to be used as topical sedative. The plant itself is not dangerous, except if it is eaten. 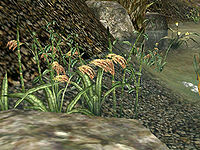 Salt Rush is a plant which grows in clumps in the marshes of Murkmire, it is known have needle-sharp leaves. It is used as an ingredient in the creation of artificial Toad Musk. Saltrice is a foodstuff raised by farmers and plantation owners. 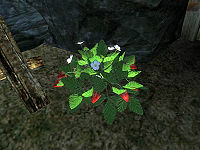 Saltrice is the base ingredient of the local Morrowind brew Mazte. 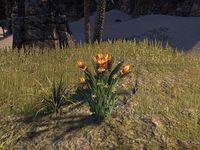 It grows wild in the Grazelands and Azura's Coast regions of Vvardenfell, but can be found on many plantations in the Ascadian Isles. 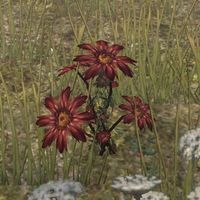 A rare flower found in the Alik'r Desert. Its known for its' hallucinogenic properties and is sometimes used by the Ash'abah in rituals. 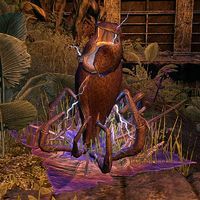 Scathecraw is long, tough reddish grass growing in the thermal ash regions of the Ashlands, Molag Amur, and Red Mountain regions of Vvardenfell. 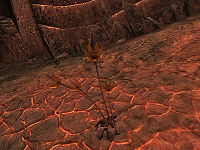 The plant also spread to the ashlands of southern Solstheim after the Red Year. 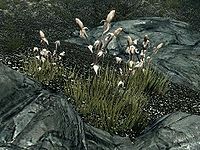 The rieklings of Solstheim call it redgrass and ritualistically burn it. The soft inner flesh of the plant can be used in alchemy. 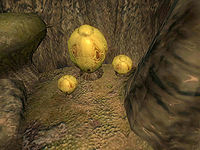 Screaming Maw is a yellow pod-like plant native to the Shivering Isles, found in the cave systems of the Mania region. Scrib Cabbage is a green, leafy domesticated plant. 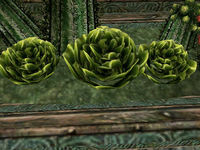 It is grown in planters throughout the city of Mournhold in southern Morrowind. It is named after the Scrib, the larval form of Kwama. 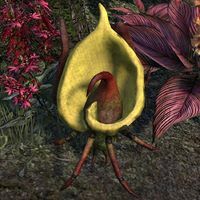 Scuttle Blooms are fauna-like flora which grow in Murkmire. Easily startled, they will with retract their "legs" and burrow half into the ground to protect themselves when they detect danger. 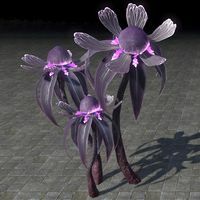 When they are harvested, scuttle blooms produce a honey-like substance as well as the side-effect known as "Scuttle Sprint" which temporarily increases the harvester's speed. Sedge grass are greenish-white shoots of tundra grass that grow in Wrothgar. Echatere are known to graze upon it, giving it the nickname "Tundra Hay." Patches that grow near the open water are naturally more salty. Sedge grass is sometimes used in Orcish cuisine. Seriweed is a broad-leafed bush that is covered in hairs, and grows in Black Marsh. It is incredibly rare, and is a powerful curative, which will warm the mixture when added to the proper reagents and give those afflicted by poison a swift and painless recovery. A bio-luminescent purple fungus species spotted in Murkmire and the Spiral Skein. Sitting upon tall, strong stalks, the caps of these mushrooms have a glowing, feathery growths draping down between large fronds. A low-lying plant with orange flowers whose fibers can be spun into thread and used to make Silverweave clothing. Slough Ferns grow in shallow pools of water in the Bitter Coast region of Vvardenfell. 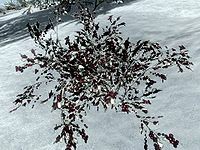 Snowberry bushes grow throughout many snowy holds in Skyrim. 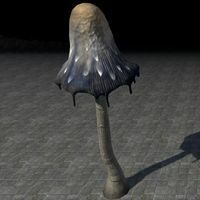 A dark, fist-sized fungus with a pleasant smell found in Wrothgar. They grow near Clan Shatul's lands, where Echatere are used to find these delicacies beneath the snow. Somnalius is fern-like green leaves arranged around two or three central stalks on top of which a single bulb of seeds grows. It originates in the Black Marsh, and may also be found throughout the Great Forest and West Weald of Cyrodiil. Soul Husks are tubular, fungus-like structures that grow in the Soul Cairn. They are notable as being one of the only forms of life found in the realm. They can be eaten as a source of food, or used to protect the imbiber's soul from being drained through interaction with the Ideal Masters. Eating them also grants resistance to magical attacks. Soul Husks can be purified into an extract through alchemy, which provides more substantial magical effects. 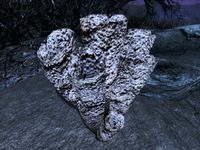 Souls trapped in the Soul Cairn have been known to use the husks as a form of currency. 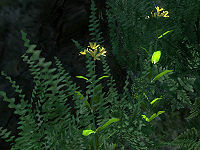 The Spiddal plant, a sickly yellow flower with sharp stems, grows in abundance in the more hostile Planes of Oblivion, particularly Mehrunes Dagon's Deadlands. The plant releases a poisonous yellow gas as a defense mechanism, although dead and domesticated specimens don't. Their stems (or "sticks") are highly sought by alchemists. 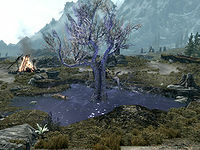 Spiky Grass grows by water in the colder regions of Tamriel. 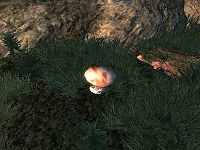 Its grass pods can be used in alchemy. Wild Spiky Grass is a rare variant of the species and can grow to immense heights in the right environment. Sometimes Spiky Grass can become ashen due to exposure to volcanic activity, which imbues its grass pods with different alchemical effects. 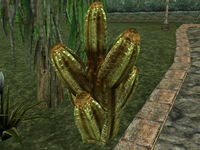 Spiny Lloramor is large green cactus found throughout the city of Mournhold. The spikes are of interest to many alchemists. A Spongecap of the Button variety, found on Vvardenfell. A buttery-colored species of mushroom. The Button variety is native to the volcanic island of Vvardenfell, and is quite large. Spongecap shrooms also grow in smaller varieties, often appearing in patches. St. Jahn's Wort is a tall thin plant with a clump of small yellow flowers. 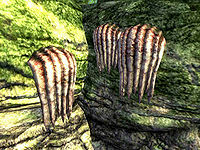 It is found in the Great Forest and the Gold Coast of Cyrodiil. 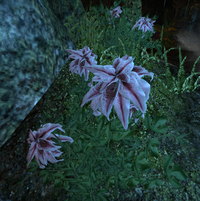 Starblossom is a very rare plant which can be found in Murkmire. They are used in rituals by the Dead-Water tribe, whereupon they burn the petals and inhale the smoke which grants them visions, the power to fight "Kaju dream-beasts" and learn their "killing-names". 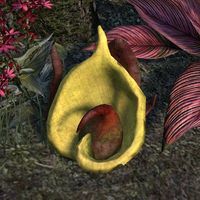 Static Pitchers are a species of carnivorous plant which can be found in Murkmire. They capture prey by electrocuting creatures they detect wandering close. Steel Blue Entoloma is a small mushroom with a domed cap and a relatively thin stalk. 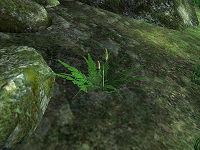 It is found growing mostly in the Great Forest of Cyrodiil. 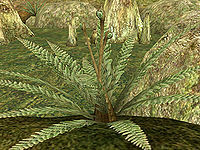 A variety of reed native to the marshes of Murkmire and is known for its' unpleasant aroma and sharp leaves. It is used as an ingredient in the creation of artificial Toad Musk. 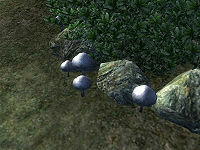 A tall species of mushroom native to the island of Vvardenfell with white spots near the edge of the caps. The caps of these mushrooms resemble umbrellas, with drooping "fringe." 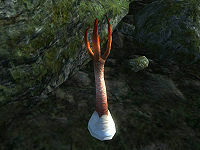 Stinkhorns are small claw shaped fungi found in Cyrodiil's cave systems and the Blackwood region. 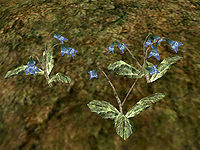 Stoneflower is a small blue flower commonly found in the Ascadian Isles and Azura's Coast regions of Vvardenfell. 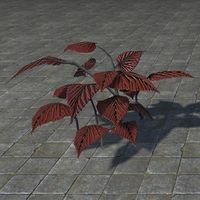 Dangerous plant found mainly in Valenwood and Shadowfen. The Strawberry Bush is a short shrub found across the West Weald, with strawberries flowering from them. This edible plant is exceptionally sweet. It grows near Cropsford, and was the secret ingredient in a renowned chef's recipe for goblin food. Summer Boletes are a short type of mushroom, easily distinguished by their golden-brown mottled cap. They grow mostly in the Great Forest and Nibenay Basin of Cyrodiil. Swamp Anemone are Anemone that grow on land that resemble Sea Anemone. They grow in both Deshaan and Vvardenfell and grow outside of swamp areas despite being called Swamp Anemone. They make a make a distinct slithery sound as they move their tentacles. 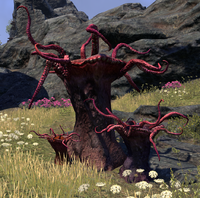 Swamp Tentacles are a thick plant found hang from rocks and cliffs in the Dementia region of the Shivering Isles. 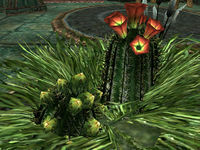 Sweetbarrel is a commonly found cactus-like plant that grows in Mournhold. Sweetpulp can be harvested from the plant. This page was last modified on 9 March 2019, at 21:42.